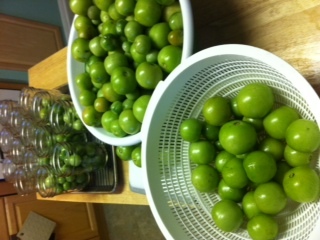 what do you do with 8 pounds of green tomatoes? why, pickle ’em, of course! the tomato plants in the veggie garden have been looking rather sad these past couple of weeks, i think its the colder weather at night, or the sun not performing to its fullest during the day… whatever it is, i decided on saturday that they were coming down to make way for the crimson clover seeds i ordered to create some green manure over the winter! 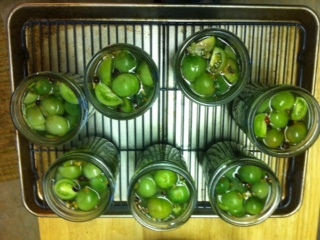 The recipe below can make from 12-21 pint jars (or 6-10 quarts), I used about 5-8 pounds green (no red at all) tomatoes – can be grape, cherry, or if bigger you may have to cut them up so they can fit nicely in the jars. Put all of these ingredients in a stock pot and bring to a boil. Once the brine comes to a boil, fill your jars (that are already filled with the tomatoes, herbs, spices) until about 1/2″ from the top. Screw on the lids until finger-tight. Place in hot water bath to process for 10 minutes, after it comes to a rolling boil. Let rest in water with heat off for 5 mins. Take out, place jars on straining tray, leave them be for 12-24 hours, then check the seals – reprocess if necessary. 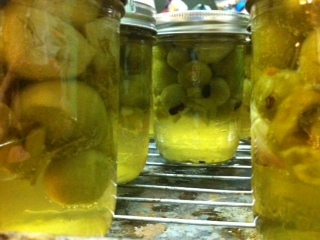 Let the pickling powers work their magic for a couple of weeks, then ENJOY! i think this calls for a GIVEAWAY!! and there are 40 others on this site to check out for yourself – truly awesome pieces of art! send me your address and i’ll get a jar out to you stat! and now, these cool lil green things (ie acorn squash) hit ripening level just the the other day in the garden. luckily the WordPress dashboard highlighted this blog post so i could try out this recipe… talk about timing right?! enough veggie talk for now – we’re on to the freebie goodness! if you’d like to receive a pint or half pint of my very own homemade salsa, leave a comment telling me which size you’d like to win and i’ll put a drawing together shortly! yuup, it’s that simple… and if you want to be extra special, if you haven’t already, LIKE the new page on Facebook! just dropping in to let you know i am still here! 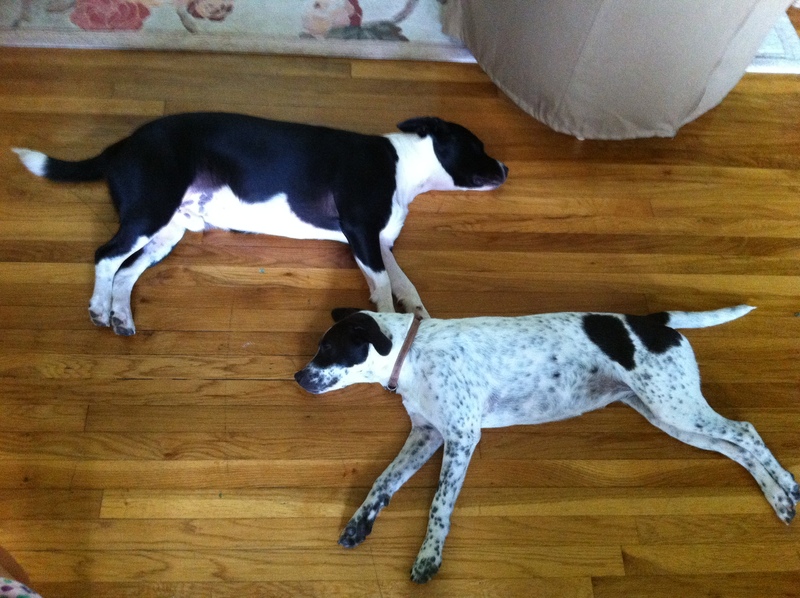 as you can see by the pooches, we’re spent – but loved every second of it!